Defence secretary Michael Fallon confirmed the launch of the Ministry of Defence's £800m innovation fund this morning at a speech in a Spitalfields back alley. Announced back in July, the tech creche will concentrate on getting the UK's technology industries to start putting their inventions and ideas forward to “Defence”, with the MoD trying to play catchup with similar US initiatives. We’ve witnessed a technological revolution where the private sector, rather than the public now takes the lead. It’s opened up our world, making cheap and sophisticated technology available to all... Previously technology went from the military to the civilian sector. We want to turn that on its head. He added: "Finally, we will be faster, accelerating the transition from idea to service." Not all of the 150-odd industry delegates were immediately on board, however. Chris Aylett, chief exec of the Motorsport Industry Association, raised the point that many in his industry are “reticent to engage with defence” because of the perceived inefficiency of the MoD and its subsidiary agencies, not to mention MoD “prime contractors”, large defence companies such as BAE Systems. “Are all the primes supportive and will they accelerate their processes?” he asked, to general laughter. “No reason why not,” said an optimistic Fallon. Harriett Baldwin MP, minister for defence procurement, added: “We're about SMEs not in a prime supply chain,” adding that the department's “exhortation” to big defence firms to use SMEs is “not perfected at this stage but an aspiration”. Another question from the floor raised the “speed of partners in the MoD's Centre for Defence Enterprise”, which was said to be “very slow”. Simon Cholerton, director of defence science and technology (which, confusingly, is separate from the Defence Science and Technology Laboratory) said, “DSTL... delivers in partnership with the private sector”, pointing out that 16 per cent of the government-owned research establishment's budget is earmarked for spending with industry partners. Legendary wartime prime minister Winston Churchill famously warned about letting scientists innovate for innovation's sake. One industry representative questioned Baldwin about whether the government was hoping for “unplanned opportunism” to come up with defence equipment of the future. 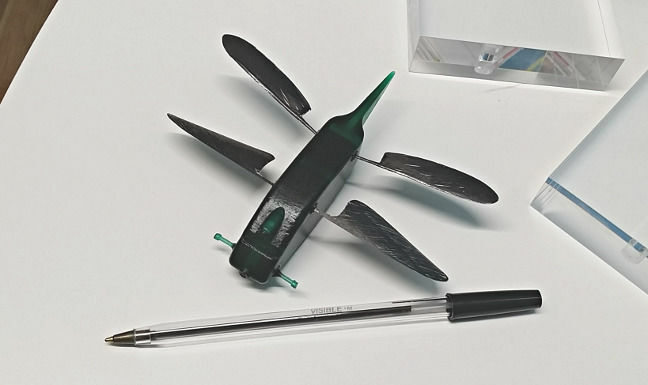 Amongst the handful of successful defence items on display at the event was Animal Dynamics' Skeeter drone, a tiny dragonfly-type item used by soldiers to look over walls and peek around corners without exposing themselves to enemy fire. It flies by flapping its four polymer carbon fibre wings. The company's Adrian Thomas, who has spent 40 years studying how animals fly and how fish swim, explained that thanks to Skeeter's “suspension-like wings” it is more resistant to strong winds and buffeting than comparable helicopter-type drones. * “We’ve chosen this collaborative space in Spitalfields to show our determination to change the culture, remove barriers to creativity and harness the curiosity and ingenuity that has made us so effective,” said the defence secretary. Your correspondent is all in favour of curiosity and ingenuity but bumping into the minister for defence procurement, Harriett Baldwin MP, in the aforementioned unisex toilets takes the “removing barriers” part a step too far.